Joyce Wycoff Connecting through Art: The Question: What Do I Want? This morning, art mentor Ariane Goodwin, asked the question I've been asking myself intensely over the past several weeks: What do I want? What do I want to do? What life do I want to lead? What is still undone? Who do I want to serve? Where do my talents and skills intersect with the world's needs and ills? My art has been on hold, my life has been in suspended animation, my decision making has been put on sabbatical till I come up with an answer. Actually, I'm looking for more than "an" answer since I already have large sheets of Post-it paper hanging all over my hallway filled with answers. I want an answer that makes me say "Eureka! That's it." I want an answer that connects all the disparate parts of myself into a beacon of energy, imagination, purpose, and service. I want an answer that lights up like the flood light that swept the night sky in front of our local theater as it scored the coup of being the first to show the movie "Lincoln" in our area. And, then, there it was. Sitting right in front of me as if it had been waiting for me to clear the fog so I could see it. Years ago … so many years ago that it feels like a different life … I started a small newsletter called, "MindPlay." Two forces intersected to bring this newsletter into being. I was tired of having my writing proposals rejected … and, part of my job involved marketing a group of physicians. I talked the group into buying a desktop publishing software package, which I used in my off hours to produce an 8-page newsletter where I could write about anything that interested me with no qualms about rejection letters. Sort of an early, hard-copy blog as a matter of fact … one that went on for almost 8 years and took me places I'd never imagined. Anyway, one of the early things I wrote about was an idea that came from someone else … the idea box. The process was a way to evaluate ideas by putting them in a box (literally or figuratively) and to forget them for a time. When you came back and opened the box and the idea was bigger and brighter, it was a keeper. I've been doing this for years and generally find that when I open the box, most ideas have shriveled to dust. But, this morning when I opened the box, one sprang out like a jack-in-the-box and shouted, "I've been in this box for 30 years … stop pushing me back down!" OK. OK. I get it. So, a "new/old" idea is now on my planning sheet. It's not ready for prime time but I'm going to put it through its paces to see if it can hold up to the roller-coaster of implementation. In the meantime I'm going to explore some of the questions Ariane poses in her message this morning. If you don't have a great answer to the question: "What do I want? ", I highly recommend that you check out her post. 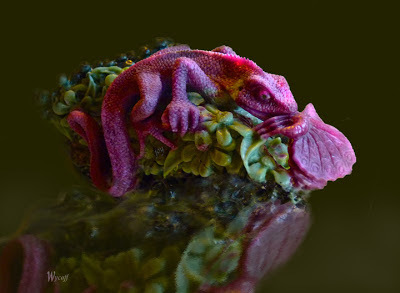 About this image: "Pink Lizard"
Recently I met a new friend and, through a series of conversations, discovered that she has an amazing collection of gems and minerals. She invited me to come photograph some and make art from them. This carved piece is the first in a series. It reminds me of how much I want interesting conversations with fascinating people. Sometimes, the 'idea' that is resting, is actually in motion. Sounds like you're living in motion. I've stuffed my note back in my box several times since first hearing about this adventure/walk http://www.caminodesantiago.me.uk/ but it just keeps bubbling to the surface. I saw the movie which included this 'walk' and it made me want to do it even more. Then I read Susan Ott's blog as she was walking the trail last year and it wanted to do it EVEN more. But my old body and older feet say - can you really do this? And for some reason I still hear 'yes you can!' So I think I might bring it out of the box and actually start planning this great trip for next Spring (seems to be the best time of year to do it). By then the wedding, the baby, all that stuff will be off my list for this year and my time will once again be my own.